You find the 'canarian pine tree' (Pinus canariensis) on all of the Canary Islands in heights between 800 and 2000 meters. Canarian pines with their very long needles are especially adapted to the dry climate of the Canary Islands. The needles 'catch' the water directly from the humidity during night time, from the fog and from the clouds, from where it drops down to the ground and thus provides the tree with lots of additional water. This species of pines also survives even big fires, as you can see, if you open your eyes when driving up from Vilaflor to the Cañadas, where there was a very heavy fire in the year 1999. The pine tree near the cache is called 'Pino Gordo' (thick pine), because it is the biggest pine on the whole island. 45 Meters high and nearly 10 meters of amplitude. Cache does NOT contain a pen. Puedes encontrar el 'pino canario' (Pinus canariensis) en todas las islas canarias en alturas entre 800 y 2000 metros.Pinos canarios con sus acículas largas son especialmente adaptados al clima seco de las Canarias. Las acículas 'cogen' el agua directamente de la humedad nocturna, de la niebla y de las nubes, de donde gotea sobre el suelo y así provee el arbol con mucha agua adicional. Esta especie del pino también sobrevive fuegos muy graves, como puedas ver, a no ser que abres tus ojos, si conduces de Vilaflor a las Cañadas, donde hubo un fuego muy grave en el año 1999. El pino cerca del cache se llama 'Pino Gordo' , porque es el mayor pino de la isla. 45 metros de altura y casi 10 metros de circunferencia. Cache NO encierra un lápiz. 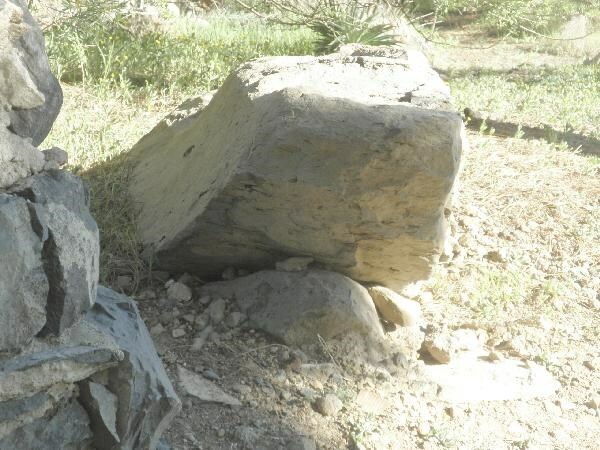 Man findet die 'kanarische Kiefer' (Pinus canariensis) auf allen kanarischen Inseln in Höhen zwischen 800 und 2000 Metern. Kanarische Kiefern mit ihren langen Nadeln sind ganz besonders an das trockene Klima der Kanaren angepaßt. Die Nadeln 'fangen' das Wasser direkt aus der nächtlichen Feuchtigkeit, aus dem Nebel und aus den Wolken auf, von wo es dann auf den Boden tropft und den Baum mit einer Menge zusätzlichen Wassers versorgt. Diese Art der Kiefer überlebt auch große Feuer, wie du sehen kannst, wenn Du Deine Augen auf dem Weg von Vilaflor in die Cañadas aufmachst, wo es im Jahr 1999 sehr heftig gebrannt hat . Die Kiefer in der Nähe des Cache wird 'Pino Gordo' (dicke Kiefer) genannt, da es die mächtigste Kiefer auf der ganzen Insel ist. 45 Meter hoch und fast 10 Meter Umfang.